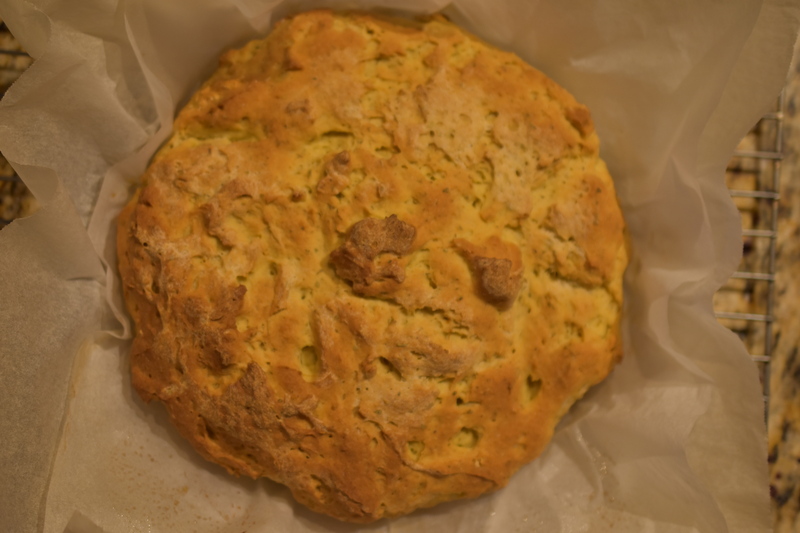 I used to make a Rustic Italian Herb Bread when I was eating gluten. Needless to say it has been a long time since I have made that bread. When I would make bread from scratch I would even grind my own flour with a grain grinder. I bought my wheat kernels from a co-op by 50 pound buckets. You can probably tell I took making my own bread seriously. I had people buy my homemade wheat bread from me. It was that good. However, when I figured out what was causing my digestive distress my bread baking days were over. I am pretty excited about making this new version of Rustic Herb Bread that is gluten free. Baking gluten free bread is different from baking with gluten. I am still learning and experimenting with recipes. Don’t forget to follow my blog to see what new recipes that I have for you. I will always strive to bring you the best and most delicious gluten free recipes in the blogosphere. Mix together and set aside. Let the yeast do its work. Whisk together dry ingredients. Set aside. Using a stand mixer with the paddle attachment, combine wet ingredients with the dry ingredients. Slowly add the yeast mixture to the combined dry and wet ingredients. Make sure it is well combined. Use an 8 or 9 – inch pie pan. Line with parchment paper. Spray with oil. Spoon dough into pan. Cover with an oiled piece of plastic wrap. This is necessary to keep the dough from sticking. I also drape a light weight tea towel over the bread dough. Let rise until dough has doubled in volume. Bake until bread sounds hollow and is golden brown, about 35- 45 minutes. Cover with foil if the bread is starting to brown too quickly. Remove from pie pan and let bread cool completely. Note: Do not open oven door during the first 20 minutes. It can disrupt the bake-rise process of the bread by letting heat out.